In Cohen v. Aponte (4D09-1985), the Fourth District reversed an order denying a motion to quash service of process because the plaintiff/appellee failed to strictly comply with the requirements for substituted service pursuant to Section 48.161, Florida Statutes. “Perfection of substituted service requires strict compliance with the statutory prerequisites because such service is an exception to personal service.” Wyatt v. Haese, 649 So. 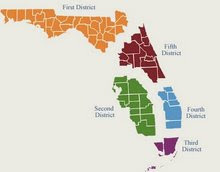 2d 905, 907 (Fla. 4th DCA 1995). The statute has three requirements: (1) notice by registered or certified mail; (2) filing the defendant’s return receipt; and (3) filing an affidavit of compliance “on or before the return day of the process or within such time as the court allows . . . .” Id. ; § 48.161(1). Here, the plaintiff complied with the first requirement, but failed to timely comply with the second and third. The Secretary of State accepted and filed the summons and complaint on September 23, 2008. The return day of process was October 13, 2008, twenty days after service. However, the plaintiff did not file the returns or the affidavit of compliance until October 28, 2008, fifteen days late. See Parish Mortg. Corp. v. Davis, 251 So. 2d 342, 343–44 (Fla. 3d DCA 1971) (finding that section 48.161 was not complied with when the affidavit of compliance was filed after the return day of process, and the notice of service was not mailed to the defendant “forthwith”). We therefore reverse and remand the case to the trial court to quash service of process without prejudice to allow the plaintiff an opportunity to perfect service.